The Code is a comprehensive document. Sometimes it can seem quite daunting to quickly find the information you need. This series of articles provides a guide to help users find their way through this critical document. This is not intended to replace the notes in Appendix B or the explanations of individual requirements contained in the CEC Handbook** but will hopefully provide some help in navigating, while reading the code. The 24th Edition of the CE-C, Part I, (C22.1-18)* is now available from CSA Group. In this article: Annex J18, which is permitted, optionally, for use in additions, modifications, renovations or operation and maintenance of existing facilities employing the division system of classification. The rules of Annex J18 are normative (mandatory) where used and amend or supplement other requirements of the Code. Additional informative (non-mandatory) information is contained in Annex JB. Due to the size of this annex, it will be discussed in multiple parts. This is Part A. Rule J18-002 provides special terminology definitions for terms used in this section that are supplementary to the definitions in Section 0. Rule J18-010 provides that unauthorized repairs or alterations shall not be made on live equipment and that equipment shall be maintained in its original safe condition. The General Part of Annex J18 applies to all installations and equipment installed under this annex. Rule J18-056 states that each room, section or area must be considered a separate location for determining the classification of the hazard. Rule J18-062 permits the provisions of rules J18-100 to J18-160 to be suspended for Class I location type electrical equipment and wiring located in pressurized equipment rooms or enclosures constructed and arranged so that a protective gas pressure is effectively maintained. ◦ automatically de-energizes the electrical equipment being protected upon failure of the gas detection instrument. Rule J18-070 reiterates that exposed non-current-carrying metal parts of electrical equipment, including the frames or metal exteriors of motors, fixed or portable luminaires or other utilization equipment, luminaires, cabinets, cases, and conduit, shall be bonded to ground in accordance with Section 10. In the next instalment, we will be discussing Part B, Class I locations of Annex J18, of Appendix J. * The source for this series of articles is the Canadian Electrical Code, Part I, (C22.1-18) published by CSA. ** Note the CEC Handbook is also published by CSA. William (Bill) Burr is the former Chair of the Canadian Advisory Council on Electrical Safety (CACES), former Director of Electrical and Elevator Safety for the Province of BC, and former Director of Electrical and Gas Standards Development and former Director of Conformity Assessment at CSA Group. Bill can be reached at Burr and Associates Consulting billburr@gmail.com. 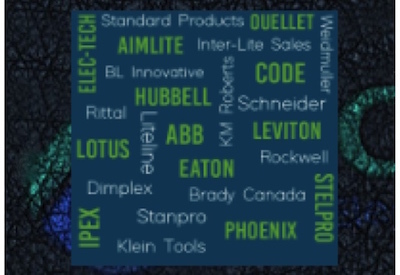 The winners of the New Products Competition at the MCEE 2019 trade show were announced tonight; innovative products that can increase the efficiency and safety of mechanical and electrical installations. One Billion Can-Twist… And Counting — Ideal Canada Celebrates Milestone with Great Canadian Classics Contest! As industry experts you know the products you use everyday better than anyone and should have input on what information you receive about products and what could improve them. Therefore, we want your insight on the biggest challenges or issues you face when installing loadcentres, breakers (CAFI, GFI's…) and other surge protection devices. We ask that you do not provide product specific details but rather your general issues and concerns or any questions that have come to mind while working with these product types. Provide us with your valued expert insight into the issues you have faced so manufacturers can better inform you about the installation and use of these products. Lets generate some discussion that will help guide the Industry. Climate change and its associated impacts will play a central role in Canada's electricity future. In fact, the Conference Board of Canada estimates that approximately $347.5 billion will need to be invested in electricity infrastructure to maintain the system reliability we have today. Making smart investments now can improve the system and help to avoid more severe climate related costs in the future. “The critical infrastructure we rely on to power our daily lives must remain resilient to more damaging and frequent extreme weather events,” says Mary Cianchetti, President of Standards at CSA Group. “Standards play a critical role in making that happen. The BC Electrical Association in conjunction with the Victoria distributors and manufacturers committee on Vancouver Island will be holding a tradeshow and golf tournament on May 2, 2019 at the Westin Bear Mountain Resort. This will be a table top trade show. Distributors have agreed not to hold their own tradeshow three months on either side of this date to ensure a successful event. Energy Efficient Lighting is a LED lighting manufacturer with nearly 30 years of industry experience. One that was founded on principles of environmental sustainability and responsibility to future generations. Based out of Markham, Ontario, Energy Efficient Lighting are established veterans within the LED lighting industry. And with the prominence of LED lighting being a fairly recent industry trend, it is a claim that a select few can make. They offer complete lighting solutions for commercial and industrial applications. Their product lines include conventional lighting fixtures, LED retrofit kits, complete LED luminaires, LED systems, drivers and electronic ballasts. The i-meter MF3 is a 3-element meter, compared to the i-meter MF6 which is two element meter. The i-meter MF6 provides 1 extra 3-element meter in the same enclosure. This allows for the monitoring of Volts, Amps, KiloWatts, Power Factor, Frequency and Harmonics [V, I, kW, kVA, PF, Hz, THD (V/I)], of 2 meters in 1. Winnipeg-based 3-Phase Electrical prides themselves on the high calibre of work they produce and their attention to detail, always ensuring that all work is performed to the highest possible standards. Their success is attributed to understanding their customers’ needs and continuously exceeding customer expectations. Their expertise is facilitated by a solid foundation of careful planning and diligent scheduling, both of which are key elements to delivering projects successfully. Today the whole planet is talking about climate, reducing the ecological footprint, and energy efficiency. Various governments are making commitments to reduce greenhouse gas emissions and people are becoming more aware of the impact of choices they make on a daily basis. Another phenomenon that is accelerating in parallel is the search for lower costs among households with increasing levels of debt and companies seeking to remain competitive and profitable. The Blue e+ series of cooling units are now also available in a stainless-steel version as standard off the shelf. Rittal will be presenting these energy-efficient units for the first time at SPS IPC Drives. They offer cooling outputs ranging from 1.6 kW to 5.8 kW. This improvement is particularly suitable for applications in the food and beverage industry, as well as in the process industry, where high levels of corrosion protection are called for. The new stainless-steel variants of the Blue e+ cooling unit series have been specially developed for demanding environmental conditions. The industry directly employs almost 107,000 people, but less than 1 in 20 is aged 25 or under, only 1 in 4 is a woman, and just over 1 in 10 is from a visbile minority. These statistics are from EHRC’s Workforce in Motion, a labour market intelligence research initiative for the years 2017-2022. The research report is a planning and informing tool for a wide range of electricity sector stakeholders and provides critical information to the sector for both short and long term resource planning.